The past month has literally blown by in a sea of BBQs, pool parties, get togethers, road trips, etc. And all this socializing has left me a little behind on recipe testing / actual cooking – I’ve been surviving mostly on leftover BBQ, thrown together salads, and a few simple standby recipes like this and this. 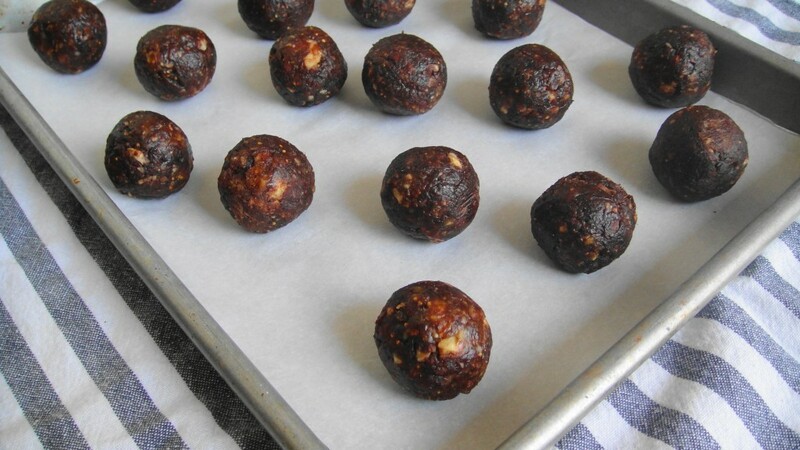 However, in the summertime spirit of eating light to keep it tight, I thought a raw, vegan snack ready in five minutes would be a good way to go. Perfect for post-workout/road trip/breakfast-to-go type snacking. 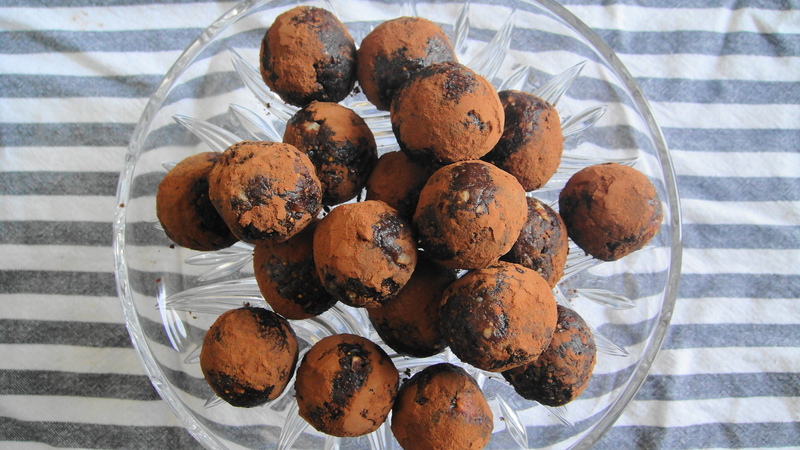 Now these may look like truffles, but they are more like homemade Lara Bars in ball form. 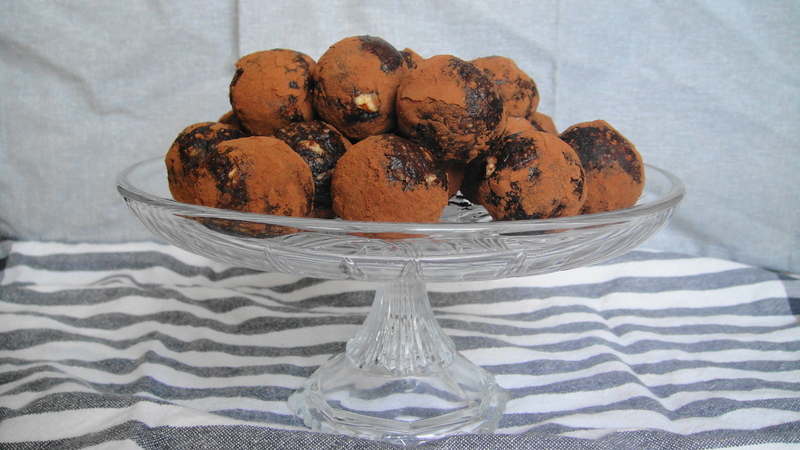 Thus the name ‘powerballs’ instead of ‘powerbars’. As per usual, D was my first taste tester and I may have forgotten to tell him that part. He thought they were chocolate truffles and was pretty shocked to discover that they were raw, vegan, healthy snacks after he popped one in his mouth. Also, I left one date pit in his by accident and he almost lost a tooth. Oopsy. Since my first taste testing was a fail, I brought some into the office for the team to try. And guess what? They were a huge hit. I wish I had brought more because I swear there were some serious sad faces going on. 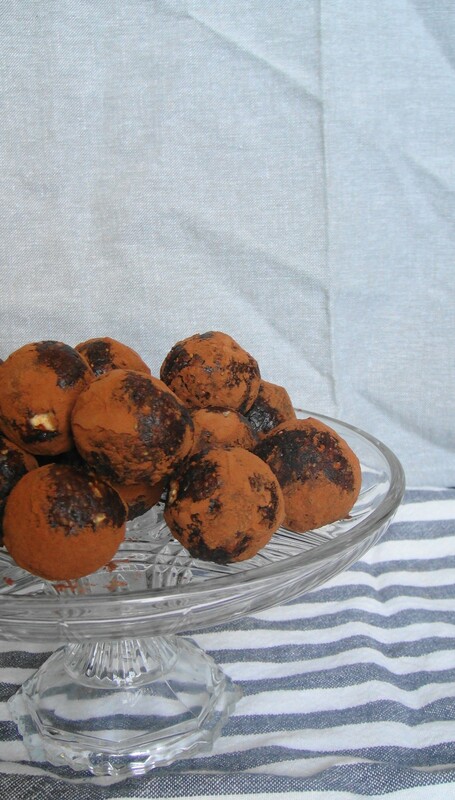 But the few who did get to try them had some great suggestions like adding different nuts, rolling the balls in shredded coconut, adding orange zest, nut butters, etc. Basically, the possibilities are endless. 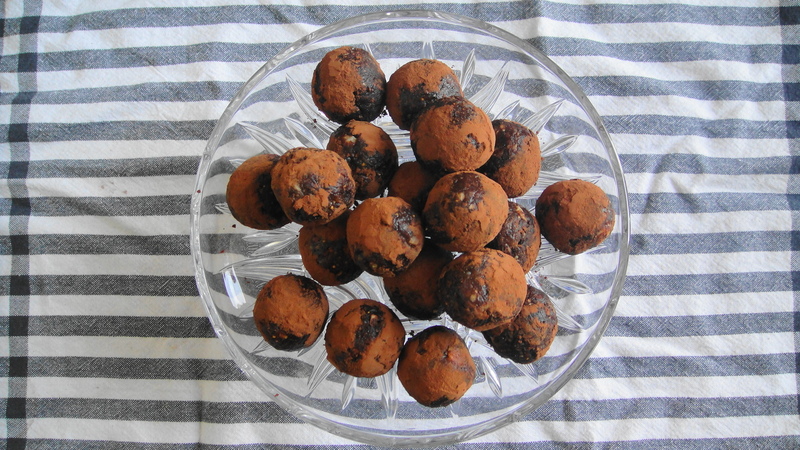 Also, this recipe is gluten free, vegan, free from refined sugar, dairy free, raw, and paleo. This recipe was adapted from a great blog called Cook Republic that features healthy, inventive recipes and stunning, inspiring photography. The original recipe called for pistachios, almonds, and orange zest and the combination made for most beautiful flecks of colour. 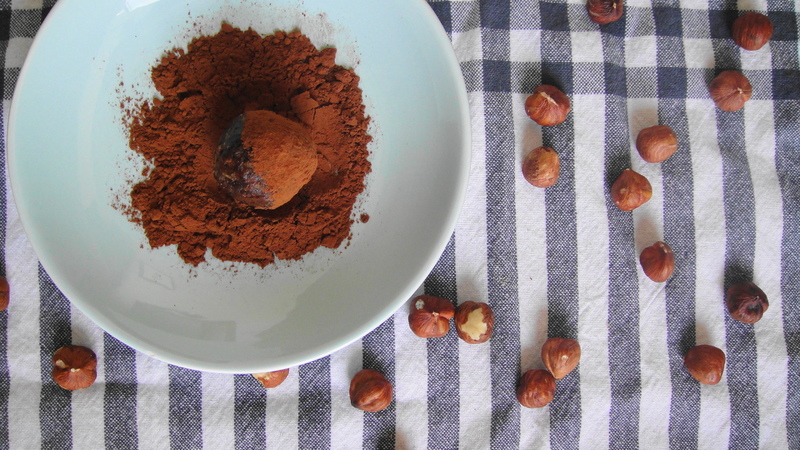 I went for a Nutella inspired version with just hazelnuts and cocoa powder. What’s most exciting about this recipe is that they actually took 5 minutes to make. Quoting my colleague ‘it’ll take longer to clean the food processor’ – it wasn’t that bad cleaning it afterwards but you get the point. This recipe is E.A.S.Y. and F.A.S.T. These pretty, truffle-esque powerballs would also be a great gift idea – especially packaged in a mason jar and a cute homemade tag. You’ll look like a hero because they would only take you five minutes to make and it’ll look like you slaved over them. 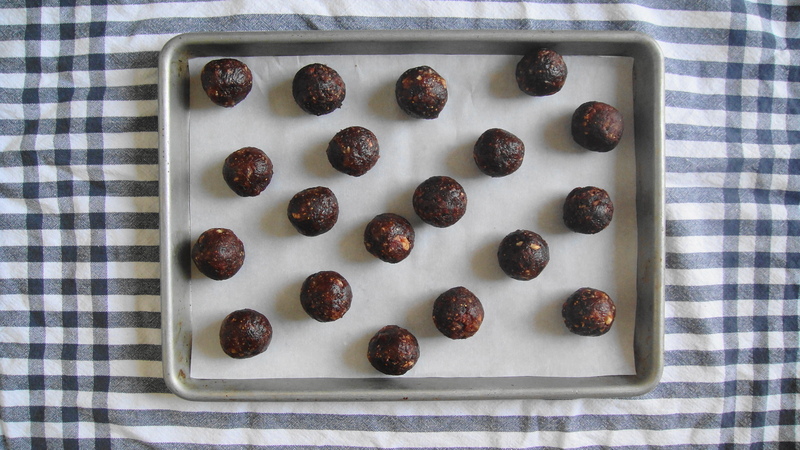 So voila, the easiest healthy snack recipe there ever was. Plus, now I know what to bring to the next work potluck. Combine first six ingredients in a food processor and pulse until the nuts are chopped and a crumbly dough starts to form. Scoop a tablespoon of the mixture and roll gently between two palms of your hands to form a ball. 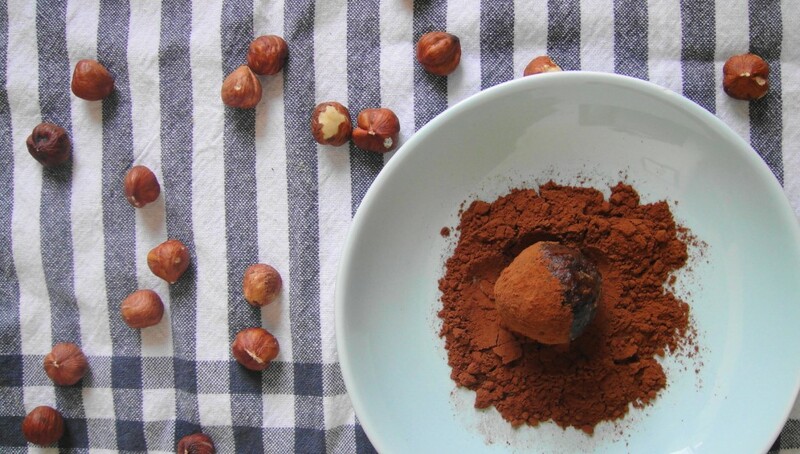 Place extra cocoa powder in a small dish and roll the ball so it’s mostly coated in cocoa powder. Tap any excess cocoa powder off. Store in an airtight container in a cool place for up to a week (although I have a feeling they’ll be gobbled up way before that).